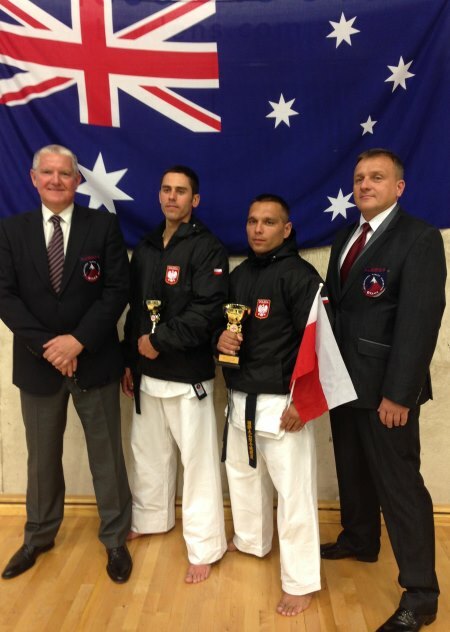 Two Polish representatives competed in 2014 Australian Open Kyokushin Knockdown Championships in Sydney, where Roman Misiaszek won a gold medal in lightweight division and Damian Krupka won a silver medal in middle weight category. Our sincere congratulations and thank You! OSU! 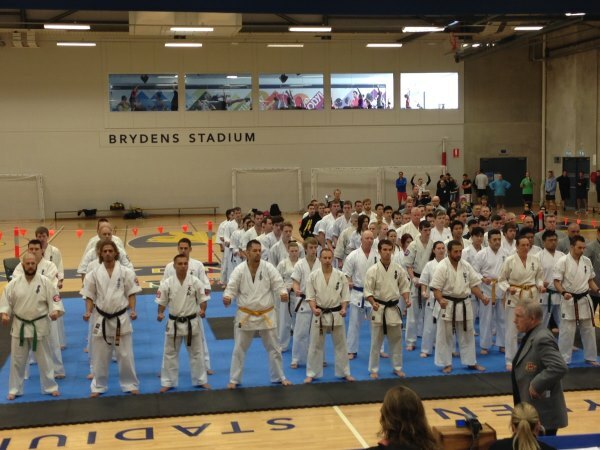 September 2-3rd 2014, Sydney University Sorts & Aquatic Center hosted the Australian Kyokushin Open Full & Non Contact Karate Championships organized by Australian Kyokushin Karate Association (AKKA) under the patronage of IKO-Matsushima Organization. Two current Champions of Poland were invited by Hanshi John Taylor (9th dan) – Vice President IKO-Matsushima and Chairman AKKA. Our fighters: Roman Misiaszek (3rd dan) representing Cracovian OYAMA Club in Krakow and Damian Krupka (1st dan) representing Malopolski Karate Club from Andrychow. Our fighters were accompanied by trainers: Hanshi Jan Dyduch 8th dan and Sensei Jacek Kasperek 4th dan. Two day Championships gathered around 330 fighters including 250 participants of non contact and 80 in Kumite. These were mostly representatives of different Australian organizations and karate styles. 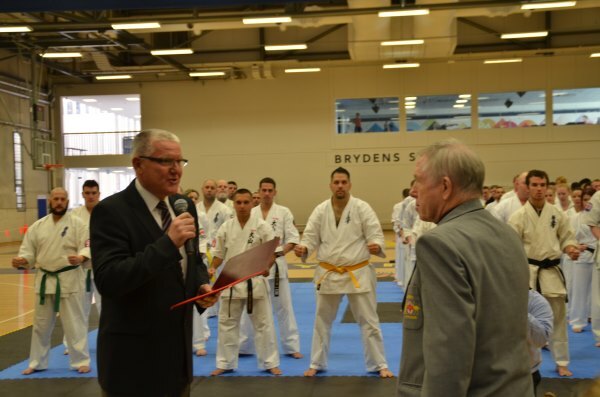 During the opening ceremony Hanshi Jan Dyduch on behalf of the OYAMA Polish Karate Federation thanked Hanshi John Taylor for the invitation and presented him with an occasional diploma. The Semi-knockdown tournament was divided into weight and belt categories. Knockdown tournament was well organized in 3 weight categories. Ladies competed in an open category. The level of refereeing was very high. On his way to the Championship of Australia, Roman Misiaszek won three fights against: Kengo Takahasi (Kyokushin), Donald Cheong (Kempo Karate) and Samuel Sheilds (Kyokushin). Two first fights finished before end time. First fight finished by shita uchi and second by mawashi geri jodan. In the final fight the opponent was not able to start. Sensei Romans fighting spirit was applauded by the Australian fans. 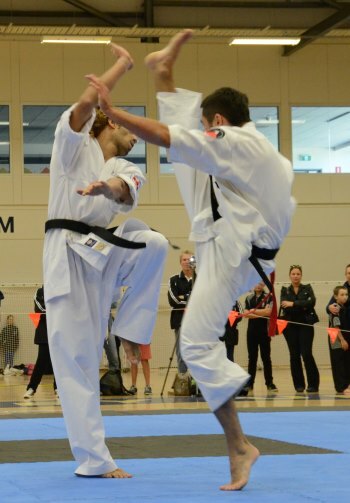 Second Polish fighter- Damian Krupka on his way to the final won against representatives of Australia: Abbasa Efaila and Farida Ghasemi (both Kyokushin) using his favorite kick Otoshi kakato geri jodan. Damian lost a final after a hard fight by judges decision to Guy Trump (Kyokushin). Our representatives and with their trainers. During the Championships our representatives had some time for pictures and conversations. Hanshi Jan Dyduch invited Hanshi John Taylor and a befriended Kancho Peter Mylonas (7th dan) - the President Kempo Ryu International Karate Organization to take part in OYAMA IKF Open Cup in Poland 2015. 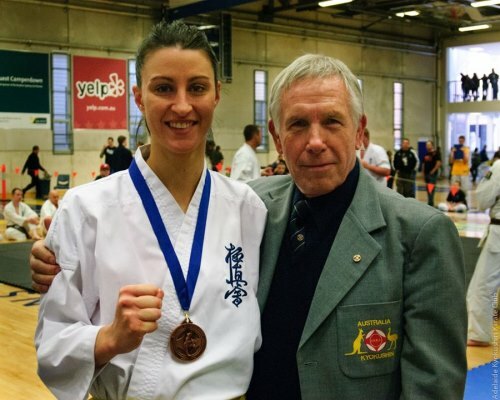 Championships were also a time to meet our kinsmen from Australia.The tournament was attended by Mr Mariusz Kaminski and his daughter Michelle from Adelaide Kyokushin Karate Club, with Sensei Aleksandr Kondakov (2nd dan). Polish team stayed and trained in the center of town right next to the green Hayde Park. In spare time the team went sightseeing all the different attractions of this beautiful town and surrounding area. 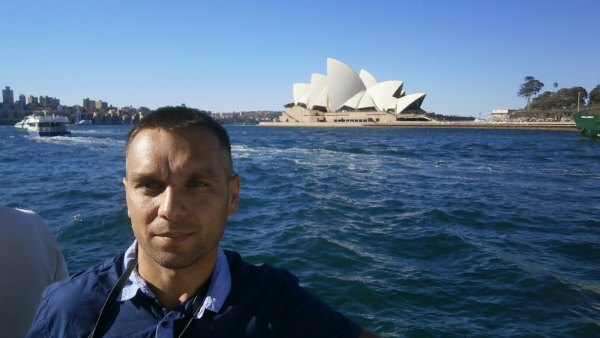 Roman Misiaszek during the sightseeing of Sydney. Foto Damian Krupka.